Ignition Systems - new MZB with lighting ! PVL analog is the choice for vintage applications. All ignition sales are final ! Please provide existing brand of ignition, and/or 9600--- or 061--- identification number of Motoplat flywheel to determine the correct PVL. Are you kicking your guts out with an old ignition system? Do you have a spare ignition to take with you to the races? Husqvarna 66-71 4-speed with small mag side crank stub installed!!! All PVL systems are an internal rotor type as pictured. They produce a hotter spark than oem, rev quicker. PVLs will not provide lighting, strictly spark for ignition. this system produces 80-100 watts at 12volts. small ac regulator eliminates need for battery. 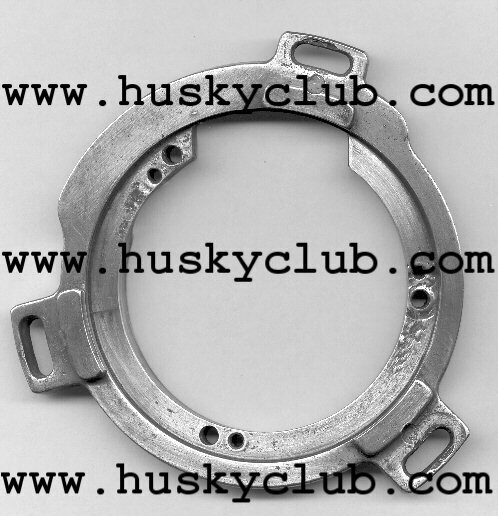 this is the oem adapter plate that you must have off the old ignition to allow the PVL stator to mount up. click photos for large view of adpater for 81 430, 82 250-500 thru 87. other adapter plates similiar. no replacement sys avail unless you change crank end with small style. PVL rotor cannot be fitted to oem large stub. 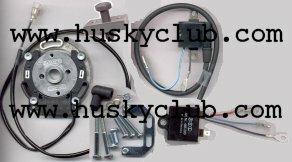 Husqvarna 4 Speed is an aftermarket distributor for the German made PVL electronic ignitions. PVL (Probosch-Vogt-Loos) GmbH consists of five different manufacturing and production divisions, and has brought over twenty years of electronics design and manufacturing experience to the world of single cylinder, 2-stroke engine ignitions. PVL employs the latest technology in the design, development , and manufacture of their ignition systems. Their technical engineers develop tailor-made ignition systems with the most modern winding and potting devices. These systems integrate material techniques, electromechanics and electronic-engineering for excellent design and function. PVL maintains a very stringent quality control and closely controlled production schedules. KTM Austria, Fichtel & Sachs, Rotax, Husqvarna Sweden, Triumph Motor Company, BMW, Stihl, and IAME are just some of the many motorsports customers of PVL, as well as Bombardier Rotax and Polaris USA. The PVL ignitions have been designed with performance in mind. By offering a higher output than most of the Original Equipment Manufacturers (OEM) ignitions found on today's competition engines, the PVL ignition can burn more fuel, thus making more power. This higher kilovolt output, along with the system's compact design, makes the PVL ignitions an ideal choice for replacement of failed OEM ignitions or as a performance accessory. PVL ignitions are an internal rotor design and are available in either analog (fixed timing) or a digital model, which includes controlled automatic advance and retard versions. 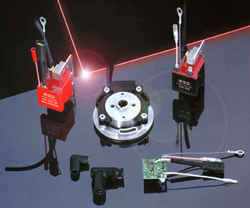 This offers the flexibility to select an ignition that will work best for your particular application. Husqvarna 4 Speed currently offers applications for Husqvarna and many vintage models of single cylinder 2-stroke motorcycle engines. If you don't see a certain application, please contact us. Given certain information, we may be able to provide an ignition system for you. 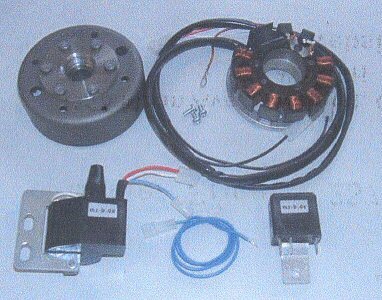 Light coil ignition solid state systems are being prototyped at this time. These systems were tested at the Leroy Winters ISDT reunion and found to produce more power than oem systems. 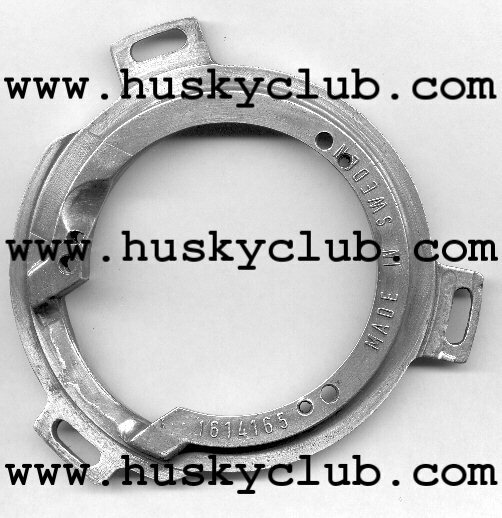 Flywheel machined to accept Husky stub shafts, backing plates to fit Husky engines are now under way.